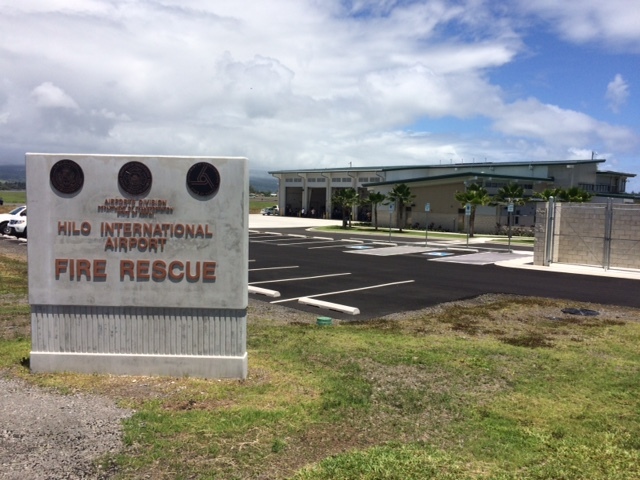 HILO – The Hawaii Department of Transportation (HDOT), Airports Division, celebrated the opening of the new Aircraft Rescue and Fire Fighting (ARFF) station at the Hilo International Airport today. 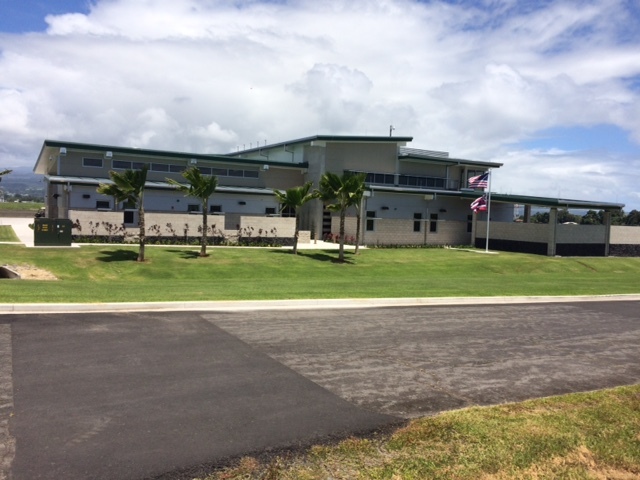 The new two-story, 21,000 square-foot facility includes an emergency operations center, four drive-through truck bays, a fueling area, along with improved work and living quarters for firefighters. The facility will also accommodate larger sized ARFF vehicles and provide training facilities to help firefighters perform at their highest capabilities. The new facility will accommodate larger sized ARFF vehicles and provide new training facilities and upgraded work spaces ensuring airport firefighters are well equipped to respond to emergencies. 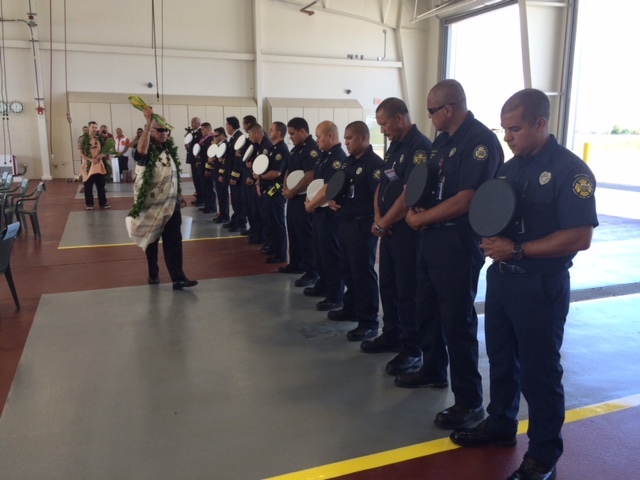 Kahu Kealoha blesses the airport firefighters during the dedication ceremony. State executives and head airport fire officers celebrate the completion of the new ARFF station at Hilo International Airport by untying the maile lei. 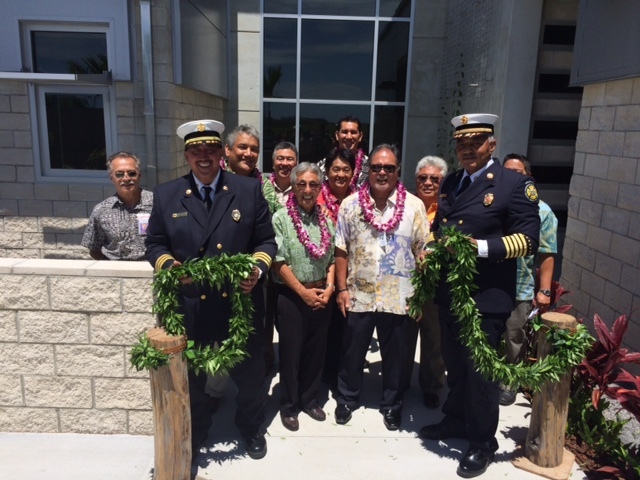 From left to right: Steven Santiago, Assistant Airport District Manager; Chief Nawai Chartrand, Airport Fire Commander; Mayor Billy Kenoi; Ross Higashi, Airports Division Deputy Director; Representative Clift Tsuji; Representative Mark Nakashima; Senator Kaialii Kahele; Wil Okabe, Governer Ige’s East Hawaii Representative; Representative Richard Onishi; Chief Martinez Jacobs, Airports Fire Chief.